The point guard position in the NBA is something that has been in a constantly dynamic state from the days of Bob Coust to Magic Johnson and now players like Kyrie Irving and Russell Westbrook. There are the traditionally small, pass-first point guards (Rajon Rondo, Chris Paul) and the players like Irving and Rose who are multi-faceted and are coveted for their ability to facilitate for others but also create for themselves. 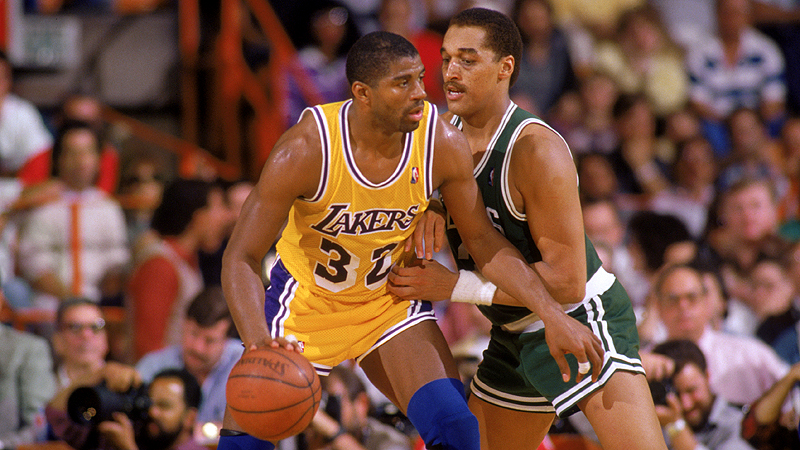 The greatest NBA point guards of all time may vary wildly in how they played the game but one thing is for sure: all fit the bill as excellent ball-handlers. 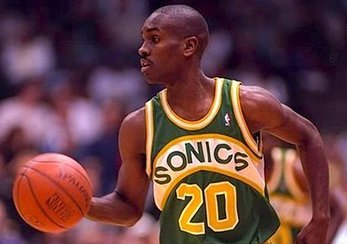 The Glove had a long and impressive career that only saw one championship because there was only really one team that won the Finals in the 1990s. While Tony Parker may give him a run for his money on this 10-spot, Payton was a premiere defensive point guard who earned a spot on nine All-Defensive First Teams and won the 1996 Defensive Player of the Year award. 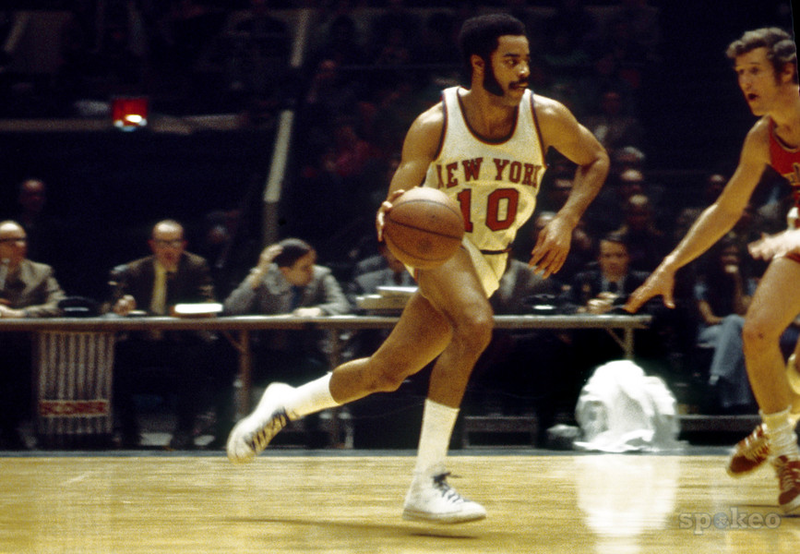 A significant cog in the two championships that the New York Knicks won in the early 70s, Frazier put up an incredible 36 points and dished out 19 dimes in Game 7 of the 1970 Finals. Like Payton, Frazier was also known for his ability to force turnovers and was named to seven All-Defensive First Teams. Now that we’ve covered our basis on the point guards that played defense, it’s time to get into some that were not quite as involved on that side of the basketball (it's a joke...well, maybe not). Nash is known for being a relatively lackadaisical defender but his two MVP awards outshine those deficits. 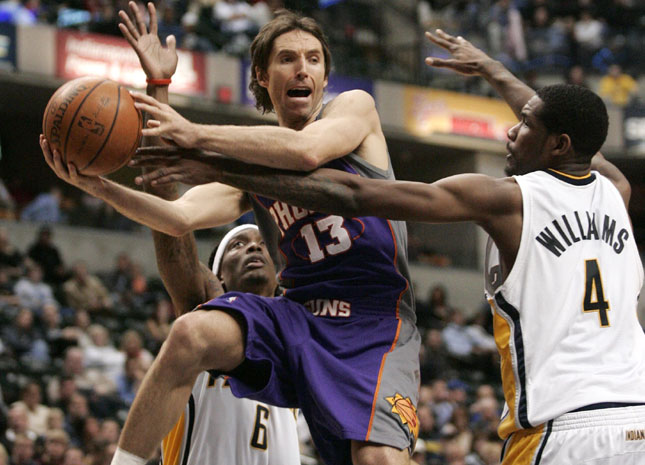 Although he may never win that first NBA championship, Nash was an incredible point guard who could thread the needle with the best passers of all time. Too many lists that I’ve read have not given enough love to this guy. 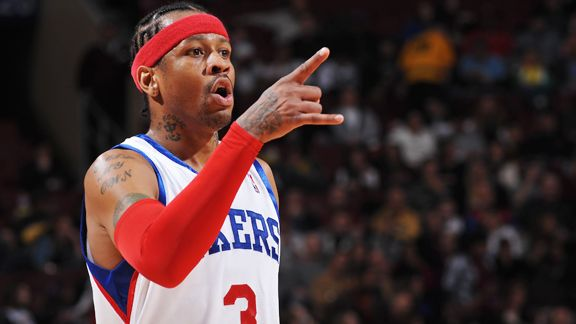 I’ll admit that I was never a huge fan of Iverson during his playing days…well maybe aside from this. But there is no denying his greatness; The Answer made the crossover an art and was arguably the best basketball player pound-for-pound at 6’0”. His style of play doesn't exactly scream "point guard" but Iverson was the prelude to players today like Westbrook, Irving, Parker, and Derrick Rose who aren't PGs in the traditional sense. In terms of legacy, AI’s at seven but if you ask me who I’d draft as a GM, Iverson as a rookie or in his prime is easily in the top-five. Although he never had the flashiness of Iverson’s scoring or Nash’s passing, Jason Kidd has been the model of consistency for nearly two decades in the NBA. 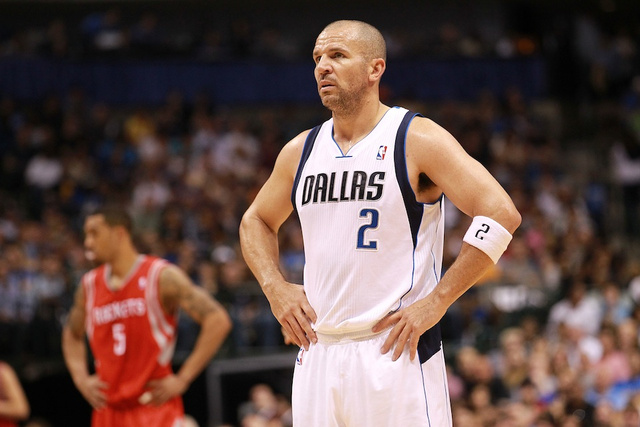 For the vast majority of his career, he was known as a pass-first point guard but even improved his outside shooting after joining Dirk Nowitzki in Dallas during 2008. After adding an NBA title to a host of other accomplishments (All-Star appearances, league leading assist numbers, First Team awards both All-NBA and All-Defensive), he solidified his legacy with the greatest of all time. The man who ran point for Bill Russell’s 60s Celtics boasts six rings and an MVP award. He led the NBA in assists for eight consecutive years and was known for flashy “street ball”-type moves. Even though his field goal percentage verged on terrible, the star PG was named to an incredible 10 All-NBA First Teams. 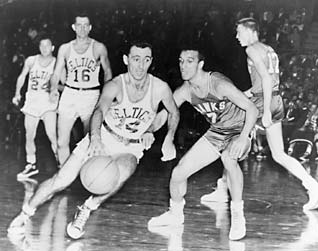 Cousy dominated a generation of basketball and put up astounding assist numbers despite the fact that there was no shot clock in the early 50s. 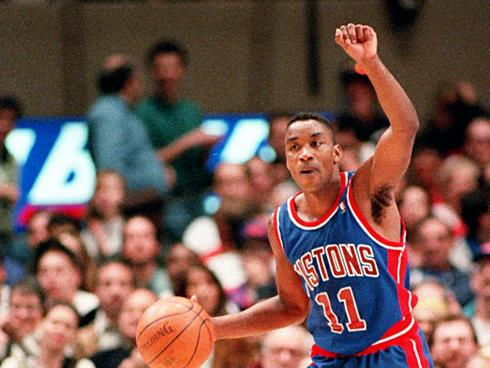 Although his post-playing career has proven to be less than impressive, Isiah Thomas led the “Bad Boys” to back-to-back NBA championships in 1989 and 1990. Not only that but in the 1988 NBA Finals, Thomas had one of the greatest playoff performances of all time after a third quarter ankle sprain (albeit in a losing effort). He owns most of the statistical records in Detroit and nearly averaged 20 points and 10 assists for his career. 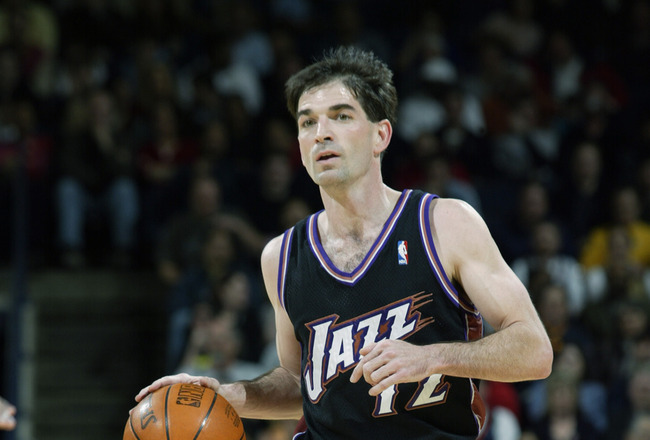 John Stockton is the best traditional point guard in NBA history. With the all-time NBA records in both assists (15,806) and steals (3,265), he and Karl Malone tore up the Western conference during the 90s. Known as the ultimate pick and roll point man, he also was able to score at an incredibly efficient rate (over 50 percent from the field and 38 percent from three). 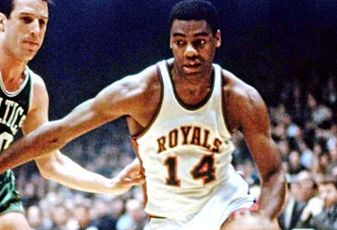 Often considered the LeBron James of his day, Oscar Robertson was a do-it-all point guard. At 6’5”, the Big O averaged a triple-double for an entire season. Not only that but he was less than a half a rebound or assist away from averaging one in three more seasons. Often considered one of the most well-rounded players in NBA history, he also has the hardware (NBA champion and MVP) to back up his case as one of the greatest. 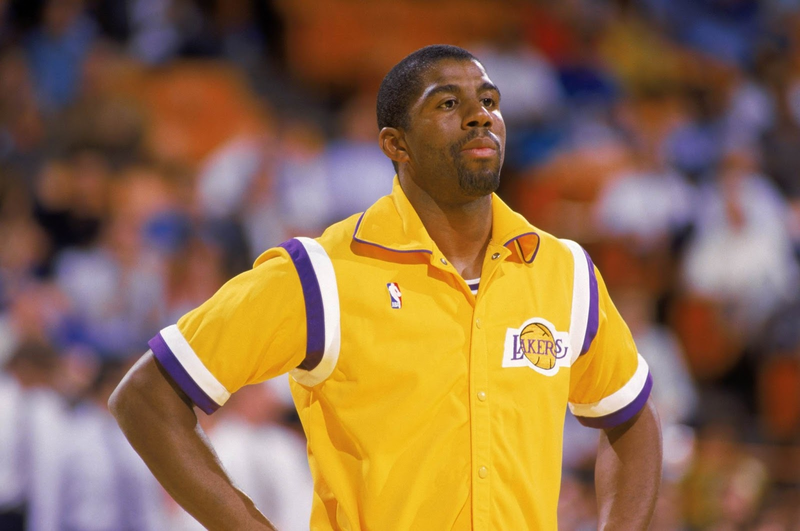 Five-time NBA champion, three-time MVP, nine-time All-NBA First Team, four-time NBA assists leader…Magic Johnson is up there as one of the greatest NBA players of all time. He is the best point guard of all time without a doubt. At 6’9”, he was quite a bit more versatile than most PGs (who were a solid half-foot shorter) but the No. 1 overall pick in the 1979 NBA Draft had a career that was great from the get-go. The only rookie ever to win the Finals MVP award, he finished off the 76ers in the 1980 Finals with 42 points, 15 rebounds, seven assists, and three steals…as the starting center. Check out the rest of our "greatest of all time" series where we have ranked the top-10 shooting guards, centers, and overall players in NBA history. With all of the ups and downs of the Western conference during this 2012-13 NBA season, the regular season is down to crunch time with less than 15 games to go. 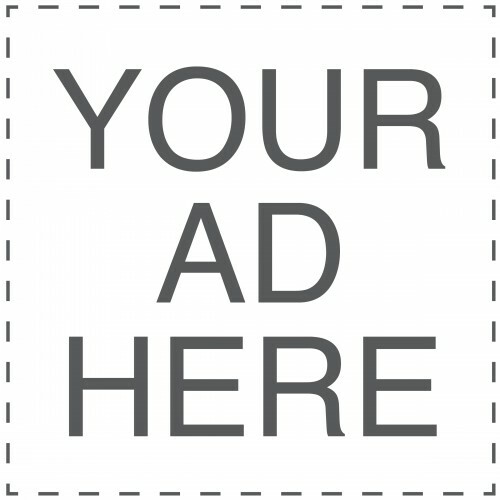 Just a short while ago, it appeared that the Golden State Warriors would be fighting for a four or five seed but the Denver Nuggets went on a cool 15-game winning streak and the first five seeds are all but locked in the West (with some chance for interchangeability among those five). However, the back end of the conference has three teams within a game and a half of the eight seed. The Lakers are hanging on by the slimmest of margins and seem to be riding whatever direction that the wind is taking them. 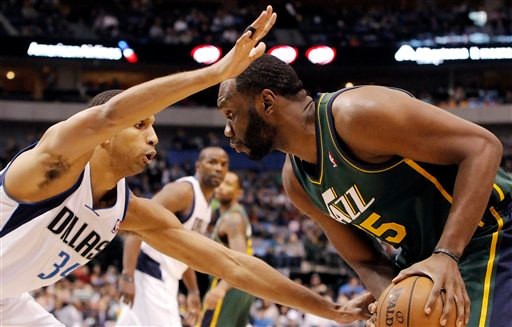 Utah has battled injuries to Al Jefferson and Paul Millsap of late and Dallas is managing to hold on despite Dirk Nowitzki averaging a mediocre 16.5 points per game (lowest since his rookie year). The Lakers own the tiebreaker with Dallas, but there is no doubt that the Mavericks are clicking right now. A record of 7-3 in their last ten games has moved them back into relevancy. expect double-digit scoring from seven or eight players a night. 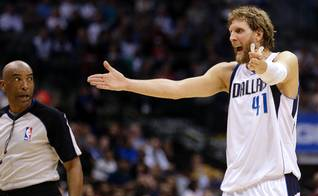 So even though Dirk Nowitzki has not had a superstar-type year with the likes of O.J. Mayo, Vince Carter, and Darren Collison, a 25-point nightly performance has not been necessary. With seven of their final 12 games at home and the luxury of playing the Hornets twice and the Kings (once), the Mavericks may be the team of these five with the best record down the stretch. As the Warriors know, the six-seed is extremely valuable. It’s a ticket not to play San Antonio or Oklahoma City in the first round. Steph Curry proved on Monday against the Lakers that his ankle roll against the Wizards should not be much of a factor. Mark Jackson will undoubtedly keep an eye on his franchise player, but the six seed is the Warriors to lose. Four of the Warriors final games are against the Kings, Hornets, Suns, and Timberwolves—literally the worst teams in the Western conference. While Oracle has provided a tremendous boost, the Warriors do have a habit of playing up or down to the competition. The Bay Area has seen some thrilling wins against San Antonio, Oklahoma City, and Miami but has also watched in horror at repeated losses at the hands of the Orlando Magic and the struggling Lakers. But with seven out of 10 games left are at home, the Warriors are lined up for their third playoff appearance in two decades. It has been a couple years since the Rockets have been in the playoffs but there performance this year has not been a surprise. Houston brought in two new centerpieces to run the show and while Jeremy Lin has not lived quite up to (the now-trademarked) Linsanity, James Harden has developed into a legitimate superstar. Six of the Rockets final 12 games are at home and they play the Magic, Suns, and the Kings (twice). With the support of Chandler Parson and Omer Asik, the Rockets won’t be giving up a spot in the playoffs anytime soon. A match-up against Oklahoma City in the first round could get very interesting. Lakers are back to fighting for their playoff lives. Like virtually all of the teams in this race, Los Angeles does have more than half (6) out of their remaining 11 games left at home. However, their schedule is not easy and they will end up below .500 for the rest of the season and gasping for a playoff berth. 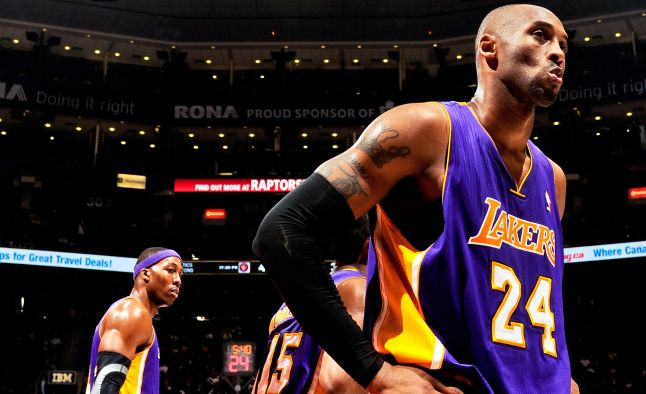 This puts LA right in the middle of my earlier analysis of the Lakers best and worst case scenarios; the reality is that Kobe’s will can only carry a team so far and it might not be enough this year. Call it injuries, lack of cohesiveness, or future Hall of Famers just not getting it done, but the Lakers will need to do serious soul-searching regardless of the outcome of this season. As impressive as the Trailblazers have been this season, a playoff seed is not in sight. Eight of final 12 games are at home but there schedule is the strongest out of these six teams. In their final stretch, the Blazers play Brooklyn, Utah (twice), Golden State (twice), Denver, Memphis, Houston, OKC, and the Clippers. Houston and Dallas are the weakest teams that they face…the odds are against Portland even winning half of those games. They will certainly vie for a playoff spot in 2014 with a star-in-the-making at point guard in Damian Lillard but it’s not going to happen in 2013. Suns, Timberwolves (twice), and the Hornets in the final stretch. Utah owns the tiebreaker with Los Angeles (season series 2-1) and the tiebreaker with Dallas (2-1). 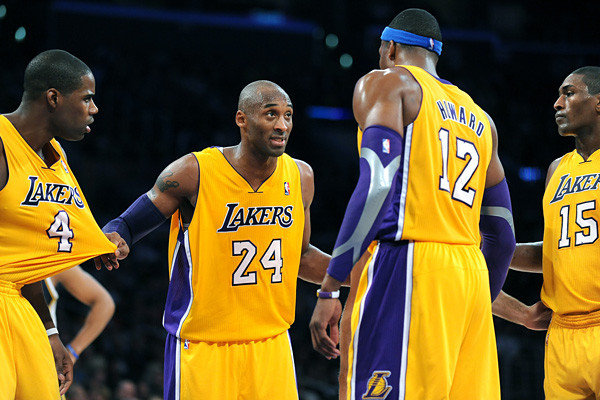 Superstars will win championships but teams with chemistry will earn playoff spots. The question is which team can pull it together? One of the teams fighting for this spot is streaky and unreliable (Lakers) and another is fighting back to get into contention (Mavericks), but the Jazz have been playing horrifically of late (4-9 in March). In a race where every game counts, the combined advantages of home-court and the tiebreaking records will matter a lot but the Jazz seem to have lost their early season promise.